The hours-long standoff began around 12:30 p.m. Tuesday when a gunman — identified by police as 20-year-old Fuaed (FOO-od) Abdo Ahmed — took two women and a man captive at Tensas State Bank branch in St. Joseph, which sits near Louisiana's border with Mississippi. 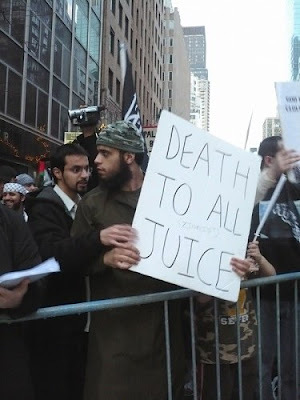 I wonder who put the device in his head, I'd bet $100 he thought it was the Juice. Fuaed joined Facebook on May 21st. His very first "like" was Islam. Pretty much every post was pictures of himself or about violence. On July 7th he posted this image. Depicting an Islamic warrior riding a lion. Lions of Islam is a common meme among Jihadis as well although he doesn't seem to be an overt Jihadis. Much like the Tsarnev Brothers he has other interests which include Hip Hop and Sandwiches. So its appropriate to note that mental illness, Islamic Jihad or violence and Jewish conspiracy theory are not, you know, mutually exclusive categories. His brother Amen seems much more active on the Islamic side of things, including activist pages such as "Remove Everybody Burn the Koran", "Remove false pictures of the Prophet", "United States of Arabia" and "Facebook admins are racist against Islam"